What finds lodging in your heart? My wife and I are currently on a road trip through western Canada. Today I am in Edmonton, a growing, prosperous city of more than a million. 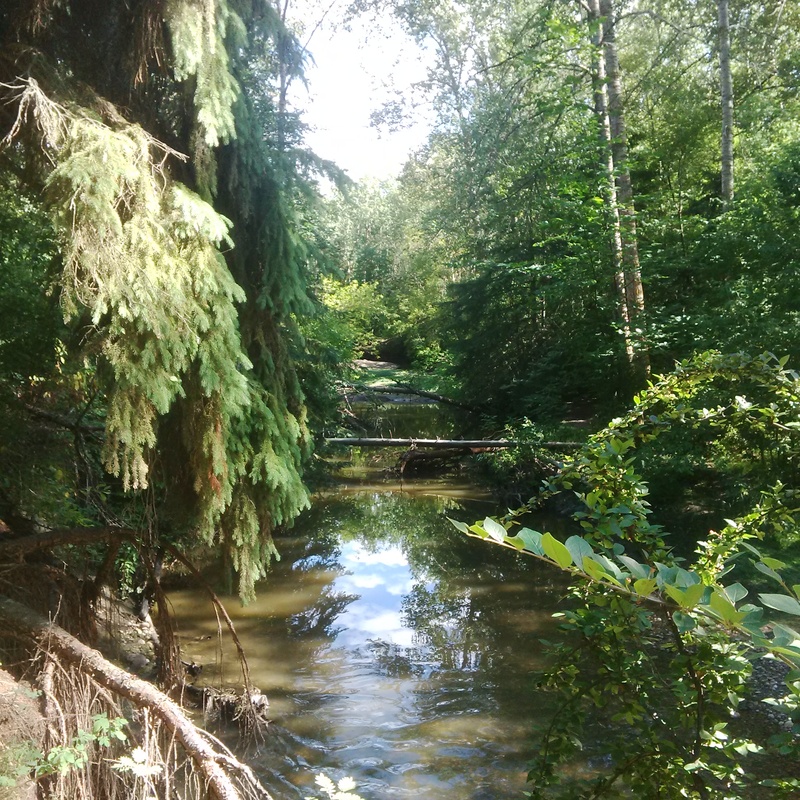 Last evening after a passing thunderstorm, I went by myself for a walk in the Mill Creek Ravine. There in the cool of the evening I was surrounded by the beauty of God’s creation. After the heat of the day, it was a quiet place of refreshing. and devastated his homeland (NIV). Have you caught a glimpse of the devastation? It seems that the psalmist, Asaph, had a good look at it. Now take a good look at his words. They have left the dead bodies of your servants as food for the birds of the sky, the flesh of your own people for the animals of the wild. They have poured out blood like water all around Jerusalem, and there is no one to bury the dead. This description reads like a segment of the evening newscast. Of course the newscast has plenty of disturbing visuals to go with it. When we look at conflict zones like Syria, Iraq and Afghanistan, we realize that bloodshed and violence are all too common in our world. Jihadi violence has spread to America and European cities too. But we don’t have to go far to find images of death and destruction. Just last week in my city an unarmed black man was beaten to death by two police officers. As is so often the case, the images were caught on camera. Violence and bloodshed are present in our cities too. Has the world gone mad? Are we sinking deeper and deeper into depravity? Have our minds become numb to the carnage? Or are we joining with the psalmist in crying out, “How long, LORD?” How long will you let this insanity continue? LORD, won’t you come and fix this broken messed up world? Our hearts cry out for justice, mercy and peace—justice for those who have been wronged, mercy for those who have been wounded and broken, and peace for all who are troubled in soul and spirit. He who testifies to these things says, “Yes, I am coming soon.” Amen. Come, Lord Jesus (Revelation 22:20). Response: LORD God, please have mercy on the people of this world. We need you here—right here with us in this broken world. Come and fix it. Come and fix us, Lord Jesus. Amen. Your Turn: Are you concerned about the state of your city, your country and the world? Hope in the LORD and keep his way. when the wicked are destroyed, you will see it (NIV). A few years ago, here in Canada’s capital we saw aspects of this psalm play out in real time. David, the psalmist states, “The wicked lie in wait for the righteous, intent on putting them to death.” A terrorist, with planned intent gunned down Corporal Nathan Cirillo, while he stood guard before the National War Memorial. This cowardly act highlights the contempt of those who celebrate evil, for those who stand for righteousness, truth and justice. The contrast between those who love peace and those who revel in violence is stark indeed. The mouths of the righteous utter wisdom, and their tongues speak what is just. The law of their God is in their hearts; their feet do not slip. The way of the LORD is the way of love. Jesus said to his disciples, “No one has greater love than this—that one lays down his life for his friends” (John 15:13 NET). Jesus then went on to demonstrate that supreme love by laying down his life on the cross for our redemption. The question we need to continually ask ourselves is what is my motivation? Am I motivated by love or am I driven by hate? Am I drawing close to the God of love and hope? Is my life a demonstration of God’s redeeming love, or am I only concerned about my selfish interests? Corporal Nathan Cirillo laid down his life in the service of his country. Which god will you serve? Will you serve the god of self, or the selfless God—the God whose hands were pierced for you? The choice is yours. Response: LORD God, we live in a very troubled world. When evil rises, we put our trust in you. Help me to walk in the way of love. Surround me with your peace. Keep those who serve their country safe. I pray in Jesus name. Amen. Your Turn: How can you honor those who lay down their lives in the service of their country? What makes their sacrifice special for you? who delivers his servant David (NIV). “Lord, why don’t you come and fix this mess?” Have you ever thought that thought, or voiced that prayer? When we look at the world around us, there are a great many things that appear to be coming off the rails. This past week the abandoned body of a toddler was found in a church parking lot in Edmonton. Where are the parents? They haven’t come forward. Who would harm a child like that? Sadly, you can check the news services and see that cases like this occur all too frequently all over the globe. It appears that the love of many has grown cold. See 2 Timothy 3:1-5. Here’s a chilling statistic. In America on average every month fifty women are shot to death by their male partners. Meanwhile gun advocates keep insisting that more guns will keep America safe—safe from whom? It seems the killers are the well-armed and well-intentioned men in our midst. On the international scene, wars, violence and mass migration are creating havoc and instability in Europe, the Middle East and North Africa. Terrorists and dictators continually amp up their threats. Has the world gone mad? In this context, David’s prayer in Psalm 144 makes a lot of sense. Part your heavens, LORD, and come down; touch the mountains, so that they smoke. Send forth lightning and scatter the enemy; shoot your arrows and rout them. David is asking for the LORD to come down and fix this mess. Down through the ages believers have prayed similar prayers. Jesus did come down to fix this mess, and the world he created turned on him and had him crucified. But we can be sure a final day is coming when he returns again triumphant. Response: LORD, I look forward to the return of Jesus. He alone can fix this mess. Lord, help me to do what I can to speed your return. Let your gospel be preached in the entire world as a witness. Amen. Your Turn: Do you believe the Lord will fix this mess? Do we have a role to play in Christ’s return? This description reads like a segment of the evening newscast. Of course the newscast has plenty of disturbing visuals to go with it. When we look at conflict zones like Syria, Iraq and Afghanistan, we realize that bloodshed and violence are all too common in our world. Jihadi violence has spread to European cities too. But we don’t have to go overseas to find images of death and destruction. Just last week in my city an unarmed black man was beaten to death by two police officers. As is so often the case, the images were caught on camera. Violence and bloodshed are present in our cities too. Our hearts cry out for justice, mercy and peace—justice for those who have been wronged, mercy for those who have been wounded and broken, and peace for all who are troubled in soul and spirit. He who testifies to these things says, “Yes, I am coming soon.” Amen. Come, Lord Jesus (Revelations 22:20). Love and loyalty will come together; goodness and peace will unite (Psalm 85:10, CEV). This week’s I Love the Psalms theme is goodness. Do you pay attention to the news? At times it can be quite discouraging listening to a daily barrage of reports about violence, suffering and war. Then there’s that other feature of the news: politicians and world leaders arguing about—you guessed it—violence, suffering and war. It can leave you wondering if there is any goodness left in our world. That’s why I find today’s verse from the Psalms so comforting. Love and loyalty will come together; goodness and peace will unite (Psalm 85:10, CEV). There’s a promise in that verse. This is something that will happen. We have God’s word on it. I want to be part of it. Response: LORD God, give me faith to believe your word. Grant me hope so that I can see you at work. Give me grace to be an instrument of peace and love in a world of discord. Amen. Your Turn: How can you be an instrument of peace this week? What thoughts find lodging in your heart? Sad to say, my wife would not dare go for a walk by herself in Mill Creek Ravine. You see, last week in broad daylight a woman was attacked there by a sexual predator. Earlier in the day I had gone to a nearby bank branch to use an ATM. At the bank, a repairman was replacing a shattered window pane and the front door had been kicked in—presumably an attempted robbery. Response: LORD God, I want you to find lodging in my heart through Jesus Christ your Son. Amen. Your Turn: Do you live in a safe city or neighborhood? Take a moment to pray for your city.